Last month, I participated for the first time in Lithuania's Sixth Women's Run.There were more than 1,400 women from all over Lithuanaia and abroad in the five-kilometer race. 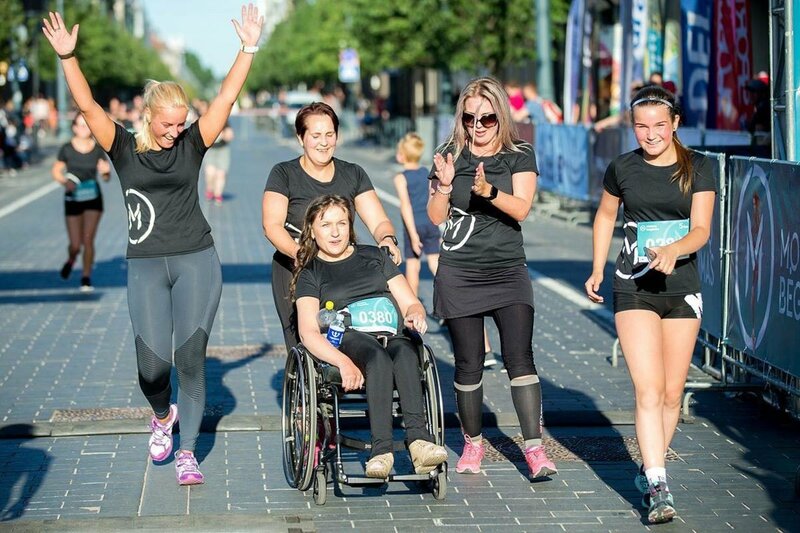 Together with them I, Vaiva Dulevičiūtė - a woman with cerebral palsy and a wheelchair user from birth, decided to take on this challenge, one of many challenge I have faced in my life. It all started one evening, as I was surfing the internet and having fun commenting on some insignificant post on Facebook. I was chatting with my friend Danutė Regelskienė and Danutė told me about the "Run Club" (“Bėgimo klubas”) group set up on Facebook. Quite soon I joined the Running Club. Danutė, who was the organizer, offered me to join her in the women's race. At first I doubted if I could manage - we always fear what we do not know. But it was enough to say that it might be fun when Danutė assembled the team which included Danute, Jurgita Jonaitienė and her daughter and Raimonda Pintukaitė. I paid the start fee, organized the transport and waited for another life adventure. I was the only wheelchair user participating in the race . We also offered other people with disabilities to join. The "Run Club" would have agreed to accompany more people with disabilities, but, to my great sadness, nobody else joined. Some disabled people considered this as a mockery for which you would still have to pay. Only two people were on wheels, me and a two-month-old baby in a stroller (children were involved in the women's race). I very much hope that my example will inspire more people with disabilities in the future . 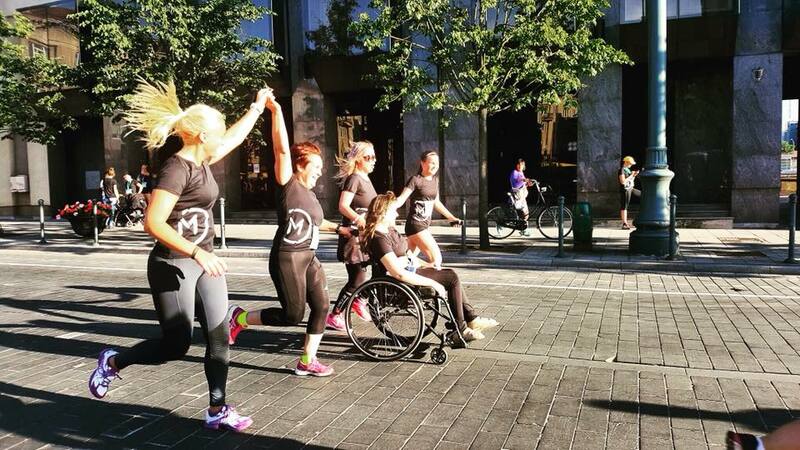 Perhaps next year, the Women's Run any other similar event will finance the entry fee for the disabled. 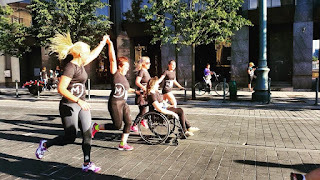 We started and finished holding hands, and each person pushed for 1km then they changed, the girls exchanged (every kilometer) for pushing my wheelchair. We got the support of the audience, applause and shouts. It seemed like we were the winners. In our hearts, we were the winners, so we only reviewed the results of race a few days after the race. Of the 1106 finishers, we came in 965th. Although we were not running on the clock it took us 34:34 minutes to run the 5 KM. On the track we also met the looks of the competitors. This was my team motivating to run even faster, some members even reached their best season result. And after the finish we were happy to receive congratulations and hugs. We decided that this was definitely not our last race, but we have just got to get more suitable wheels for the tracks. My conclusion wheelchairs and cerebral palsy are certainly not an obstacle to living a full, active life. It all depends on the approach.